Bernard Knoll of Port Charlotte Village mobile home park in Port Charlotte, Fla. flew 104 combat missions in a “P-47 Thunderbolt” fighter plane during World War II. On one mission, he shot down a German fighter in a quick but deadly dogfight. In another, he led a squadron of 16 P-47s that destroyed an enemy ammunition train. Knoll, who grew up in Holland, Mich., joined the Aviation Cadet Program in 1943 when he was 21. He took basic flight training in Tulsa, Okla.; advanced training at Eagle Pass, Texas; and wound up in England just before D-Day. He was a member of the 313 Fighter Squadron, 50th Fighter Group, 9th Air Force. Knoll’s unit’s job was to provide Gen. George Patton’s 3rd Army with air support. The “Thunderbolt” he flew was the perfect fighter for the task with its eight, .50-caliber machine guns and bomb-carrying capabilities. It was an awesome fighter-bomber that, more than any other Allied plane, played havoc with German ground forces. 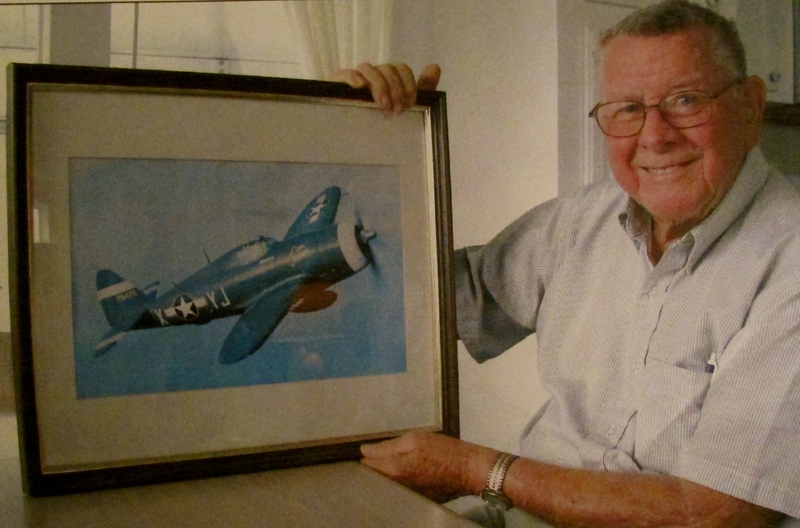 “The P-47 was the best airplane I could have possibly flown,” the 86-year-old former captain explained. “It was better than the “P-51 Mustang” and faster than the “P-38 Lightening” and could outdive anything. Furthermore, it was hard to shoot down. When Knoll arrived in England during the summer of 1944, he was assigned to the 50th Fighter Group as a replacement aviator. “When I joined my unit, four pilots lived together in a tent. The guy I replaced had been shot down and killed on his first combat mission the day before. After a while, you don’t think about something like that. You’ve got a job to do and you do it,” he said. Sainte-Mere-Eglise was the first French town liberated by American forces shortly after the landing at Omaha Beach on D-Day, June 6, 1944. “The combat mission I remember more than any other, the one I received the Distinguished Flying Cross for leading, is when my squadron of 16 ‘Thunderbolts’ ran into a German ammunition train in France,” Knoll said. “We first dropped bombs to take out the tracks in front of and behind the train so it was trapped and couldn’t escape. He was lucky — he escaped the attack unscathed. Two other members of this squadron were shot up badly, but none of the attacking P-47 pilots bailed out. “We worked the train over for 15 minutes, blowing up the individual cars. There wasn’t much left of the train when we left,” Knoll said. The “P-47 Thunderbolt” had four .50-caliber machine guns in each wing and could carry two, 1,000-pound bombs. What made it such a devastating weapon was it was very tough to shoot down. “During the 104 combat missions I flew, I only had one person in my squadron that received the Purple Heart. Either you were dead or you bailed out and were taken prisoner,” he said. Every once in a while, Knoll and his squadron would run into German fighter planes, but generally they kept their distance. “I radioed back for our squadron of 16 P-47s to break into ’em. As we broke into ’em, the German planes ran,” Knoll said. Another time, the aviator was confronted by a lone ME-109 that went on the attack. German tanks were another matter. They were tougher to kill than enemy aircraft, in most cases. “The German tiger tank was so heavily protected by armor, the only way we could knock it out was to ricochet our bullets off the ground in front of it so they would come up under the tank’s belly. Sometimes it worked,” he said. Knoll flew his last combat mission on May 7, 1945, the day before Germany unconditionally surrendered to Allied forces. By then, he had amassed 165 points to go home. This was 100 points more than was needed to take the Queen Mary home to New York. He was on a 30-day leave when the Japanese unconditionally surrendered on Aug. 14, 1945. For Capt. Bernard Knoll, World War II was over. He married, had four children — three girls and a boy — and went on with his life. In 1980, he and his wife, Lois, moved to Port Charlotte Village. Capt. Bernard Knoll received the Distinguished Flying Cross for leading a squadron of P-47 fighter planes that destroyed a German ammunition train in France. He also received an Air Medal with 16 Oak Leaf Clusters for flying 104 combat missions during World War II. This story was first published in the Charlotte Sun newspaper, Port Charlotte, Fla. on Sunday, Jan. 13, 2008 and is republished with permission. Lois Knoll died of a brief illness three days after her husband. We were honored by the presence of these fine men. We shall not see their kind again.